When family came to visit last weekend, my niece and nephew had a ball making this fun and festive Halloween healthy recipe. Just a few ingredients, a little prep, and BOOm! A yummy mummy dog. It’s an easy, healthy eating snack to make with a group of little (or big) goblins. Preheat oven to 375 degrees F. Unwrap bread. Stretch each bread stick to 12 inches. 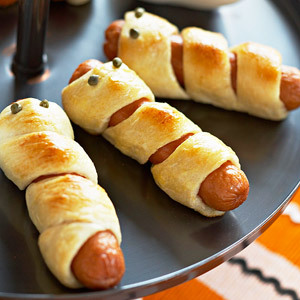 Wrap dough around frankfurters, letting the frankfurters show slightly through the bread. Press in capers for eyes (or you can also use a toothpick to dab some ketchup). Bake in preheated oven for about 12 minutes or until bread is golden brown. Serve with Ketchup and mustard. Hat tip to Moon Dreams and Day Beams blog. Wow. This looks yummy. It doesn’t whether this is for Halloween recipe only. But I still wanna try this. Thanks for sharing anyway.